The Town of Wendell is excited and honored to learn that Frank “Jakie” May will be inducted into the 2018 North Carolina Sports Hall of Fame! Mr. Sid Baynes of the Wendell Historical Society came before the Wendell Town Board on November 14, 2016, requesting support for nominating Jake May to the North Carolina Sports Hall of Fame. The Board concurred with the request and assisted with letters of support. On April 22, 2017, the Town of Wendell celebrated Jake May's 100th anniversary of entering professional baseball by renaming Opening Day at the Park to Jake May Opening Day. In recognition of Jake May’s fourteen years in the highest levels of major league baseball, several years in the minors, and a lifetime as a model citizen of Wendell, the Town of Wendell further honored Mr. May by renaming the Large Field to Jake May Field. The Town of Wendell was honored to have members of the Jake May family on hand for this momentous occasion! 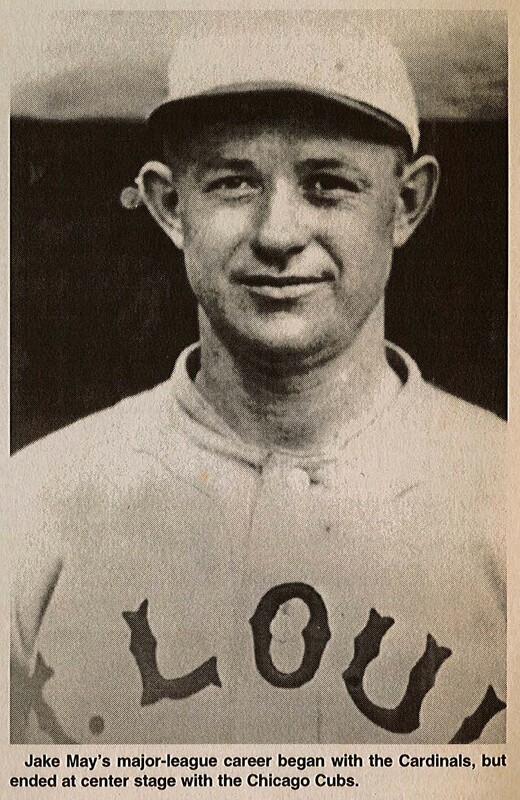 Frank “Jakie” May – known to Wendellians as Jake May moved to Wendell in 1907 at age 12, began his professional baseball career in 1917, and retired in 1932. Following his retirement, Jake returned to Wendell and was an asset to our community until his death in 1970. When Jake May moved to Wendell, he immediately became a valuable member of the town sponsored Wendell Baseball Club and competed with men much older than he. In 1917 Jake made it to the pros when he was signed by the St. Louis Cardinals. He played with the St. Louis Cardinals until 1921. From 1924 through 1930, he played with the Cincinnati Reds. He was traded to the Chicago Cubs in 1931, and he and the Cubs went to the World Series in 1932. We can only envision that Wendell families, friends and fans would gather around the radios to hear the games as the “Wee Carolinian” threw his left-handed “jug-handle curve” ball past some of baseball’s greatest hitters. It was during the 1932 World Series against the New York Yankees that Jake May struck out the Babe – twice! Wendell was proud of Jake then, and we are still proud of him today. The Town of Wendell is fortunate to have a Wendell Historical Society that was passionate and persistent in submitting Jake May as a candidate for induction into the North Carolina Sports Hall of Fame. What a great accolade for Frank “Jakie” May! The N.C. Sports Hall of Fame was established in 1963. A permanent exhibit is located on the third floor of the N.C. Museum of History in Raleigh and features significant objects and memorabilia donated by inductees.